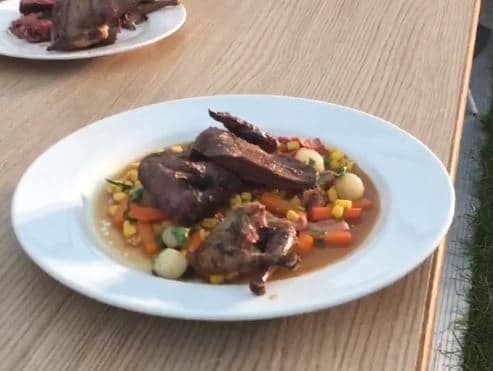 Bryn was on stage at the Taste of Game Kitchen at Countryfile Live this year. 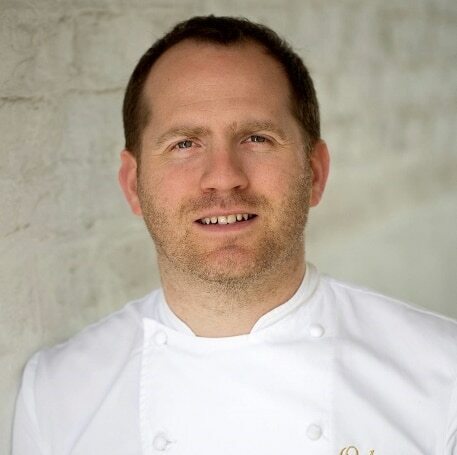 He demonstrated two great game recipes for us and the audience loved him. Here is his Braised Sweetcorn and Wood pigeon. Preheat the oven to 160°C, 325°F, gas mark 3. Season the wood pigeon well with salt and pepper. Heat up a heavy-based frying pan with a metal handle over a medium hob. When it’s hot, add 1 tablespoon of the vegetable oil. Put the wood pigeon into the pan and evenly brown it all over. Don’t rush this — you’ll get more flavour and colour if you take your time. Place the pigeon in the oven for 10–12 minutes. Remove from the oven, take out of the frying pan and set it aside to rest for 10–15 minutes. Blanche the baby onions and the carrots in salted boiling water, then place into ice cold water to stop the cooking process. When they’re cold, drain the water. Heat another frying pan over a medium hob, add the rest of the vegetable oil and cook the bacon until it’s crisp and golden. Add the onions and cook for a further 2 minutes. Cover the bacon and onion with the stock and bring to the boil. Add the sweetcorn and carrots, and simmer for 5 minutes. Then add the butter, stir through and season with salt and pepper to taste. Remove from the heat immediately. To serve, remove the pigeon from the bone if you like. 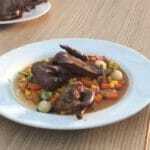 Pour the sweetcorn and bacon mixture into a large bowl or individual servings, and arrange the wood pigeon on top.